Why not organise an afternoon tea for your wedding? 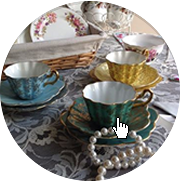 We have a fantastic assortment of beautiful vintage china , crockery and other accessories for hire to complement any special occasion. Give us a call to discuss your afternoon tea requirements and get the benefit of our vast experience. All of your chosen items will be packed and delivered to your venue. We would be very happy to organise your food for you, we have our own caterers and waiting staff so we really can offer the complete Vintage Afternoon Tea package.